"An indoor market where local artists, crafters, and designers sell unique, handmade items every weekend! 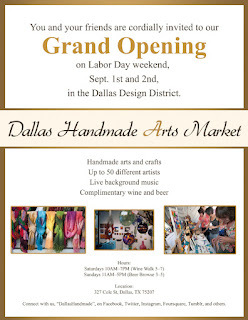 Avoid the weather and shop indoors with 50+ rotating artists plus enjoy local live music performances. Stroll, Shop and have some wine! We will be featuring Champagne for those who visit our Beautiful Market. Complimentary Wine & Champagne Happy hour 5 - 8pm." "Now including Arts & Crafts, Antiques & Collectibles, Home Décor and quality Gifts! Inside with air-conditioning. A portion of the ticket sales to benefit Project Linus (www.PLDallas.org). They will be onsite to share more information about their mission and services. Enter for a chance to win a quilt from Threads of Time." Admission: $4 per person, Kids 12 and under: FREE. "Better Block Embrace The Street event happening Sept 8 and 9 at approximately 2800 Race Street in Fort Worth. Hours are 11-3 Saturday and 11-3 Sunday. This event is a community effort to demonstrate the principles of the "Better Block" philosophy. There will be an outdoor market Place, a trunk show, a community garden, a pop-up dog park, movies, children's activities, music, art, food trucks, and a variety of business pop-ups on the street. It's going to be a great weekend! " "The All-Birdville Marching Band is hosting the 3rd Annual Moonlight Marching Madness! This community event has enjoyed great success and we expect this year’s event to be even bigger and better! The event is held at the BISD Fine Arts/Athletic Complex and this carnival-like event will feature bounce houses and other large inflatables, a hamster ball, a mobile video gaming unit, DJ, food, fun and--of course--our famous Birdville Marching Bands! "Dos Gringos Locos Market, held at Dos Gringos Restaurant the 2nd Saturday of each month starting March 10th. This is an indoor market for unique, local arts/crafts, handmade, homemade, & small business owners in our community. " "All Hand Made crafts from local artisans. Sip on Wine while you shop our crafters. Must be 21+ to enter winery." "The annual event includes a bike show (with five classes), a bikini bike wash, family-friendly fun including a face painter, vendors, silent auctions, door prizes, food, and live music by Krimson from noon to 3 p.m., Soul to Soul Review from 4 to 8 p.m., and Rock Theory from 8 p.m. to close. Donations will be accepted. Requested items include clothes, toiletries, and blankets." "Fine art show & sale, up-and-coming artist show, silent auction, children's art workshop, food, drinks, and live entertainment!"